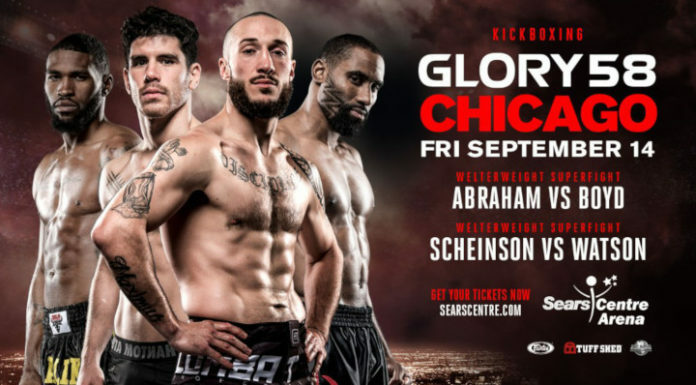 Kickboxing event GLORY 58 takes place at the Sears Centre Arena in Hoffman Estates, Ill on September 15 (AWST). The headline bout is yet to be set. Nevertheless, this week the promotion topped up the roster with six bouts. The list includes a welterweight battle between Richard Abraham (13-6, 4 KO) and Omari Boyd (11-1, 1 KO). As well, Malik Watson-Smith (59-24, 36 KO) takes on ranked No. 8 Alan Scheinson (51-7, 37 KO) also at welterweight. Both contests were added to the GLORY 58 Chicago card. Also on the card a previously announced clash of heavyweights between Benjamin Adegbuyi and Jahfarr Wilnis. Heavyweight Junior Tafa (18-3, 14 KO) goes up against Haze Wilson (24-3, 19 KO) in the main event of GLORY 58 Super Fight Series. Also on the card Matt Baker (21-6, 10 KO) faces Thomas Jenkins (3-1) at middleweight. In addition, the fight card includes a four-man all-American welterweight tournament. In one of the semi-finals Mike Lemaire (20-5, 8 KO) squares off against Omar Moreno (27-7-1, 9 KO). The second semi-final features Casey Greene (5-8, 2 KO) face off Troy Jones (7-1, 6 KO). Other bouts are expected to be announced in the coming weeks. The current lineup can be found below.